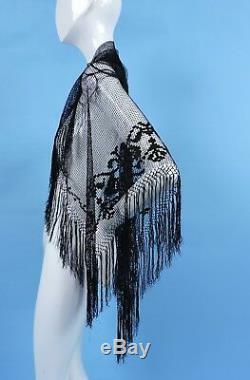 CIVIL WAR 1860S BLACK FISHNET EMBROIDERED LACE CAPE 4 DRESS. DATING TO THE CIVIL WAR ERA. 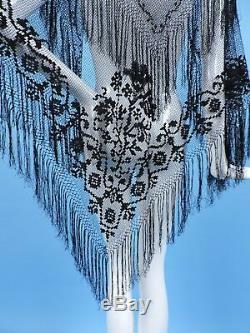 FASHIONED OF A VERY FINE BLACK FISHNET WITH SILK FRINGE TRIMMING ALL OF ITS BORDERS. 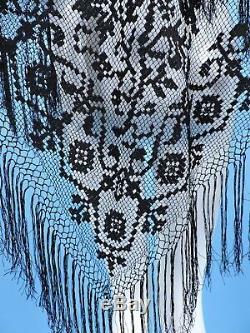 ONE FULL CORNER IS WOVEN IN A FLORAL PATTERN IN LACE STYLE. TWO SMALL BRIDE MENDS ARE HARD TO NOTE, CONDITION OTHERWISE EXCELLENT. 37 SQUARE - FRINGE MEASURES 5 INCHES IN LENGTH. Often for proper fit, hang, and wear ability, pieces will need to be altered and/or adding a hook or snap here or there, with a seam closure or strengthening needed. Vintage clothing is most often worn previously, and if old stock, often has slight imperfections from storage, a hint of color or odor. _gsrx_vers_837 GS 7.0.15 (837). 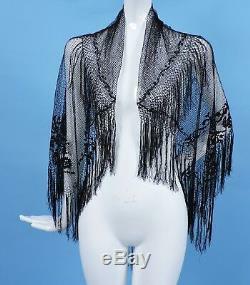 The item "CIVIL WAR 1860S BLACK FISHNET EMBROIDERED LACE CAPE 4 DRESS" is in sale since Tuesday, October 2, 2018. 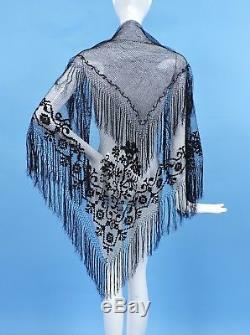 This item is in the category "Clothing, Shoes & Accessories\Vintage\Women's Vintage Clothing\Dresses".